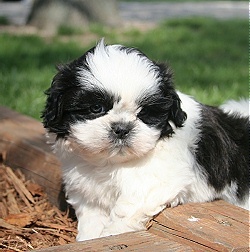 As you can see by looking at one, Shih Tzus require more care than other breeds, especially when the hair is kept long. They need daily brushing and regular haircuts to avoid tangles. However, they shed very little dander, making them a great pet choice for people with allergies. Though good family dogs, Shih Tzu are not especially good with very young children. They cannot be handled roughly or awkwardly and tend to get snappish when their patience wears thin. Feeding note: Keep an eye on Shih Tzu while they are drinking. Because their noses are so centrally located, water can easily block their breathing. The Shih Tzu is undoubtedly one of the world’s oldest dog breeds. Chinese paintings from the 6th century A.D. show Shi Tzu-like dogs, while documents from the period claim these pets were a gift to the Chinese court from the Byzantine Empire. Shih Tzu were house pets during the Ming Dynasty (1368 – 1644 A.D.) and since that time they’ve been highly prized and fiercely guarded by the Chinese. In 1908, they made their way to England, where they were bred and dispersed to Europe and Australia. The AKC certified the breed in 1969, and it has been a popular competitor and pal ever since. Shih Tzu are covered in flowing long hair, including a tuft above the nose which provides its trademark “chrysanthemum” (i.e., floral) face. On a typical Shih Tzu, the rounded head has a long beard and moustache, a short muzzle and a black nose (except in reddish brown dogs which have a reddish-brown nose). Most Shih Tzu have round, dark, wide-set eyes with pendant (hanging) ears that are engulfed in hair. The frame is longer than tall, and the tail curls over the back. Shih Tzu can come in almost any color. My favorite dog breed! The ever loving Shih Tzu!